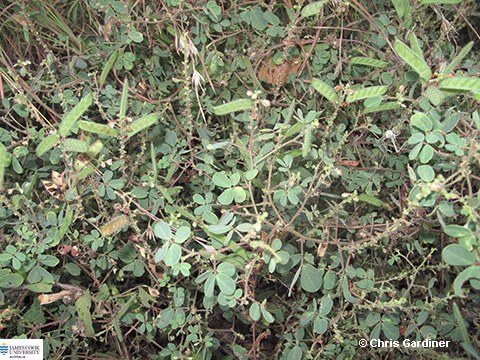 This small shrub, covered in sticky hairs, grows to about 50 cm tall, has alternate compound leaves with 2 pairs of opposite leaflets; branches are rough, much branched. There is a small gland between the lower pair of leaflets. Flowers yellow with a red centre, and 5 fertile stamens. The pod is flat to about 4.5 cm long, covered in sticky hairs; 4-6 seeds per pod, black and shiny.